Jean Schlumberger Fish Lighter, c. 1938 18-karat gold, emerald beryl, and Ceylon sapphire. Tiffany & Co. Archives. "Drawn to Beauty" is the first exhibition devoted to the Schlumberger‘s life, artistic process, and social circle. Rachel Lambert “Bunny” Mellon a noted horticulturalist and philanthropist, was a longtime friend of Jean Schlumberger. "Jewels of the Imagination" features highlights of the Rachel Lambert Mellon Collection at the Virginia Museum of Fine Arts. Schlumberger excelled at creating fanciful jewelry for Mrs. Mellon—his greatest patron—that celebrated her botanical interests. There are all kinds of methods for creating art. Jean Schlumberger's medium was gemstones. From useable objects like cigarette cases and candlesticks to extravagant fine jewelry, the designer's work sparkles. Schlumberger was one of the most celebrated jewelry designers of the 20th century. From his early days in Paris to his career at Tiffany & Co., Schlumberger attracted a faithful clientele of aristocrats, socialites and Hollywood stars. The Museum of Fine Arts in St. Petersburg is offering two complementary exhibits of the designer’s work. "Drawn to Beauty: The Art and Atelier of Jean Schlumberger” presents his early pieces, alongside drawings and historical photographs. Jorge Vidal, the museum's manager of special projects, said Schlumberger did not have formal training, but like many creative people of the 1920s and 30s, he found his way to Paris. One of Dali's collaborators was well-known avant-garde fashion designer Elsa Schiaparelli. One of Schlumberger’s first professional jobs was creating bejeweled buttons for the couturier's iconic fitted jackets. The two then collaborated on a line of costume jewelry and several of those pieces are on view, including the gilt metal cupid clips so popular with fashionable ladies of the era. Vidal says that by the late 1930's, Schlumberger was getting a lot of attention and Schiaparelli didn't like it. “It is said that Schiaparelli got a little jealous of the success and that created a rift that separated the two,” Vidal said. Like many artists in the mid-20th century, Schlumberger's career was interrupted by World War II. After serving in the French army, he moved to New York City and opened a small boutique with his childhood friend, Nicolas Bangard. One of their earliest customers was socialite and philanthropist, Mrs. Rachel "Bunny" Mellon, the wife of banking heir, Paul Mellon. Mellon was soon presenting her friends with Schlumberger creations like whimsical ruby and pearl starfish brooches. She gave then First Lady Jacqueline Kennedy her first Schlumberger jewel encrusted croisillion bracelet. Kennedy wore the bangles so often, the press nicknamed them "Jackie bracelets." Vidal said they are still being made today. Schlumberger joined Tiffany & Co. in 1956. Both he and Bongard were appointed vice presidents of their own salon at the store's Fifth Avenue flagship store. One of his most famous pieces was the mounting for the famed 128.54 carat Tiffany yellow diamond worn by Audrey Hepburn in publicity photos for the movie, Breakfast at Tiffany's. Bunny Mellon would go on to become Schlumberger's close friend and greatest patron. Vidal says she collected his jewelry as fine art, as she did with the paintings of Mark Rothko and other artists. 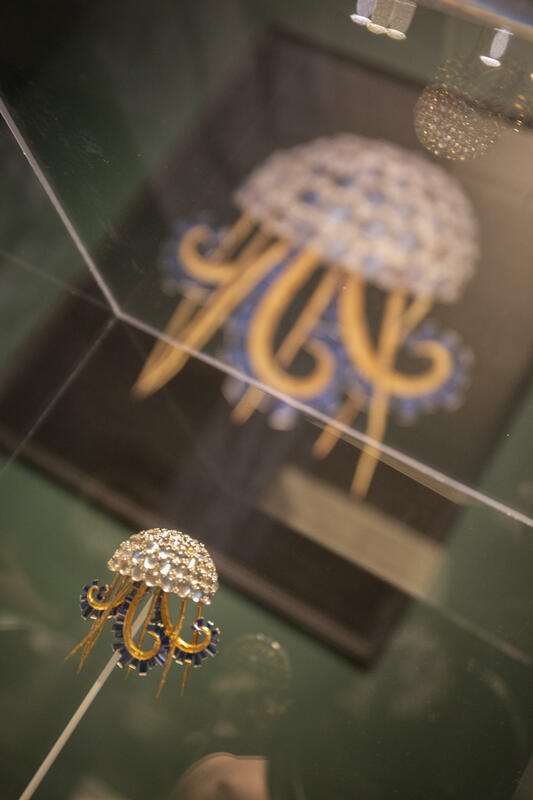 Her jewelry collection makes up the second part of the exhibition, "Jewels of the Imagination: Radiant Masterworks by Jean Schlumberger from the Mellon Collection." For this space, the museum hired an interior designer who transformed the gallery into Oak Spring Garden, Mellon's two thousand acre estate in Virginia. The first scene is a dramatic winter wonderland meant to elevate the artistic value of Schlumberger's work. It's this part of the show that really brings the bling. A 200-plus carat necklace of 16 candy colored sapphires with jasmine flowers of round diamonds is just one of the showstoppers. Then there's the brooch shaped like a jellyfish with 18 karat gold tentacles that swayed when its wearer moved. Vidal says pieces like these exemplify why Jean Schlumberger was both a jewelry designer and an artist. “When it is taken to these levels of craftsmanship and material and history, I don't think that you can deny its place among the other arts,” he said. Or its place, shining brightly, in the galleries of a museum. The Museum of Fine Arts is hosting a talk with Tiffany & Co. archivist Annamarie V. Sandecki, Thursday night in St. Petersburg. Join Sandecki for a glimpse into the longstanding relationship between Jean Schlumberger and Rachel Lambert “Bunny” Mellon. When Herb Snitzer was photo editor for the jazz magazine, Metronome, in the early 1960's, he occasionally got complaints from subscribers. Why, they asked, were there not more stories about the white musicians of the era like Benny Goodman? Snitzer says the reason was simple. The magazine was intent on covering what they knew to be true. Jazz more than any other music, expressed the black experience in America. From intricate goblets to towering church windows, glass has been used to blend beauty with function since ancient times. But it's only in the last 50 years or so that the medium was used to create art solely for the sake of art. Florida's Gulf Coast is becoming a hub for glass collections, with some in the business dubbing it the "Glass Coast." From Tarpon Springs all the way down to Naples, Florida's Gulf Coast is packed with glass art. Besides its beautiful beaches, the Tampa Bay area boasts a rich collection of art museums -- and it's growing. This week on Florida Matters we feature stories about museums and galleries in the region, part of WUSF’s occasional Art Populi series. The number of privately owned art museums around the world is booming, with wealthy individuals opting to open their own museum rather than donate to an existing gallery.